So, lets come to the important stuff… the food! Any of you may have a load of unripe green tomato that may not make it to ripe, red and succulent orbs but will stay hard, green and, well, let`s be hones, not really inviting. But no need to worry! Green tomatoes are perfectly edible and absolutely worth harvesting. There are a bunch of recipes available for green tomato chutney, pickles or fried green tomatoes. 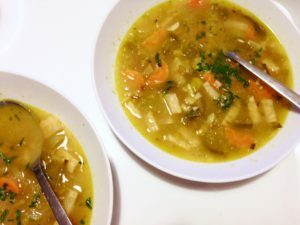 But my favorite recipe – by far – is this light but satisfying green tomato soup with a funky hint of salt cured Meyer Lemons. Heat olive oil in a large pot over medium heat and add onion and rinsed and minced Meyer lemon. Stir until tender and fragrant. Add minced garlic and soup vegetables and cook until light brown. Add green tomatoes and cook for five minutes over high heat. Add chicken stock, cover and let simmer until carrots and celeriac are tender. Adjust seasoning (salt, ..?) if necessary, but normally the Meyer lemon and the tomatoes add enough funk for a super satisfying taste.